At certain so called Detention Centres in Sweden, the personnel describe themselves as “The Migration Board’s noble knights.” The Detention Centre/Deposit is a heavy, gray building where life is administrated, guarded and scraped away. There is a feeling of the hospital, the prison. There are a number of accommodation rooms, a coffee room, a table tennis room. The rest of the building is foreboding – a world of crammed rooms with cold walls, endless corridors, offices, files, locked doors, security cards, fluorescent lit gray surfaces. Snow falling in the darkness. The detainees are not themselves criminals, they are not guilty of any offense, but they are still sentenced to be deported out of the country according to Immigration Law. An outsider is an outsider is an outsider. On one level the play is about love at The Deposit, about love’s terms in these secluded rooms, the transit’s last station which is many refugees and asylum seekers reality in Sweden as well as in many other places around the world. But on another level it is about something even more important: what happens with language in this institution, in this institution where the gamble is not only life, or love, but language itself, language which finds itself in a sort of collapse. In this hyper relevant political drama, the focus is on one of our times most unknown institutions for human administration and border control. It is a place where the future’s destiny, since Cecilia Malmström’s appointment to EU:s Migrations Commissioner, also rests in Swede’s hands. It is now that “Stockholmsprogrammet” could be put into practice. It is now that we write history. It is now that we forcefully remove another. 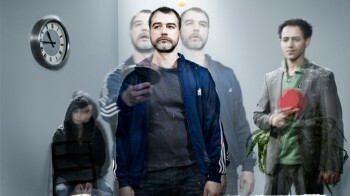 The play, written by Johannes Anyuru and Aleksander Motturi, had its premier at Stadsteatern in Göteborg the 11th of December 2009. The same day, the play was released in published form, in a limited amount by Glänta Produktion for Clandestino Bibliotek (download here). Anyurus and Motturi’s text is fiercely intelligent. Förvaret is a very intelligent text as well as a theatrical and aesthetically advanced performance, but then again the authors, Johannes Anyuru and Aleksander Motturi do come from an artistically and philosophically advanced direction.